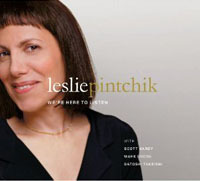 The title of Leslie Pintchik's third album, We're Here To Listen (Pintch Hard Records, 2010), says much about the pianist and composer's musical philosophy. She recognizes the importance of technical skill, but she also values instinct, the open mind and the dismissal of boundaries between musical genres. It's an approach that Pintchik emphasizes throughout this interview, conducted by phone from her New York home. It's also readily identifiable in her writing, her playing and her selection of songs by other writers. The result is a body of work that is often understated yet always evocative and beautiful. 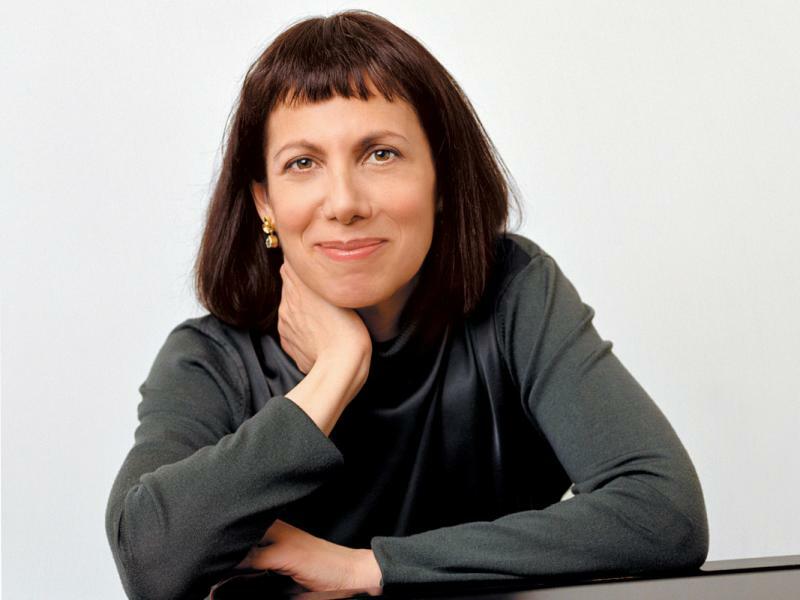 Pintchik's own route into the life of a jazz musician was unconventional: her early career was as an academic specializing in 17th-century English literature, and she was a Teaching Assistant at Columbia University when she made the decision to move into music. This was not so much a leap into the unknown as a return to her musical roots, as she explains: "My father played tenor sax as a hobby. He loved music, and I think he hoped to get me or one of my two brothers to take up an instrument. I refused to learn to playit's about the only thing I've ever refused to doand it wasn't until I was at college that I started fooling around a little bit with music. But I spent most of my time reading, because I was aiming for a career as an academic. ... While I was in graduate school, I was still casually playing a little. Then things changed gradually. I was drawn to the music as I began to really listen and hear the depth in it. 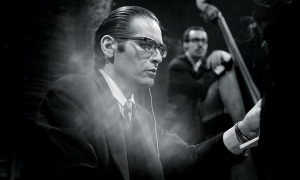 Then I decided that if I wanted to play this music with the depth and intensity that it demands, I couldn't be both a musician and an academic." Eventually, in the early '80s, Pintchik made the decision to concentrate on music. "Some of my colleagues and friends at Columbia romanticized my decision," says Pintchik, "telling me that I was leaving 'dry academics' to go into jazz. But for me, both of them are terrific things to do, but I didn't feel that I could actually achieve both. So I made a pretty sharp left and became a jazz musician. That was it." Pintchik turned to the piano with enthusiasm, but decided against a return to formal college-based study, preferring to work privately with tutors, including Bruce Barth. She also started to perform publicly, "Definitely before I knew as much as I would have liked to," as she puts it. Her early gigs were "tricky," and did not put Pintchik into the world of jazz. "My first gigs were in a Hawaiian Revuewith dancing girls, really commercialand I felt like a fish out of water. This was not what I went into music for." Things gradually improved, and Pintchik began to play a regular brunch gig at Bradley's in Greenwich Village. It was this gig that led to her first major jazz job, with bassist Red Mitchell. "Red was living in Sweden, but he would come back to the States for a month or two at a time. He met me at Bradley's and heard a tape of me playing with Scott Hardy (now Pintchik's husband and bassist). Scott was playing guitar at the time, and Red liked the warmth of the music. He asked us to play with him for a series of Sunday night gigs at the club, and finally I was free from playing the Hawaiian shows." Pintchik's longstanding trio of fellow musicians is another big part of her music. As well as Hardy, drummer Mark Dodge and percussionist Satoshi Takeishi have also worked with her for around 13 years. 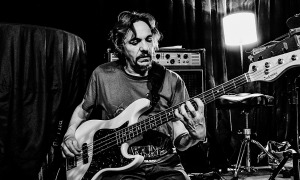 "I met Scott at a jam session when I was just a beginning player. Music came before the personal side of things. He was already an accomplished player and seemed so musical, as well as being a terrific person. I met Mark when I was playing at a restaurant, and he was in another band at the venue. He sounded like he might be a nice fit for my music, it was an instinctual thing. I heard Satoshi play at the Blue Note. The minute I heard the subtlety and power of his music, I just loved it. I don't get the chance to play with him as much as I'd like to, but he's always a terrific addition to the group." 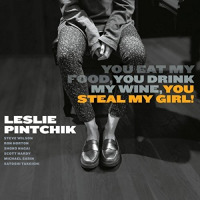 Pintchik has been a professional musician since the mid-'80s, but she did not release a recording as leader for almost 20 years. 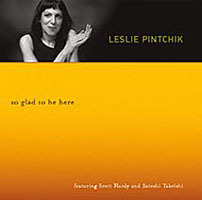 Her debut album, So Glad To Be Here (Ambient Records) appeared in 2004. The second album, Quartets (Ambient Records), came out in 2007. 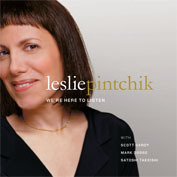 The third, We're Here To Listen, and a DVD, Leslie Pintchik Quartet Live In Concert, were both released on Pintchik's own Pintch Hard label in 2010. Such a release schedule suggests that the pianist has a very considered approach to recording: she agrees, but also says that "It probably should be less considered. Even before a recording session, I have more new tunes ready to come to life. So yes, there is probably too much space between albums, especially if you want to keep some sort of presence on the scene." 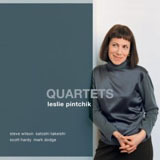 The DVD, Leslie Pintchik Quartet Live In Concert, shows her performing in an intimate setting. 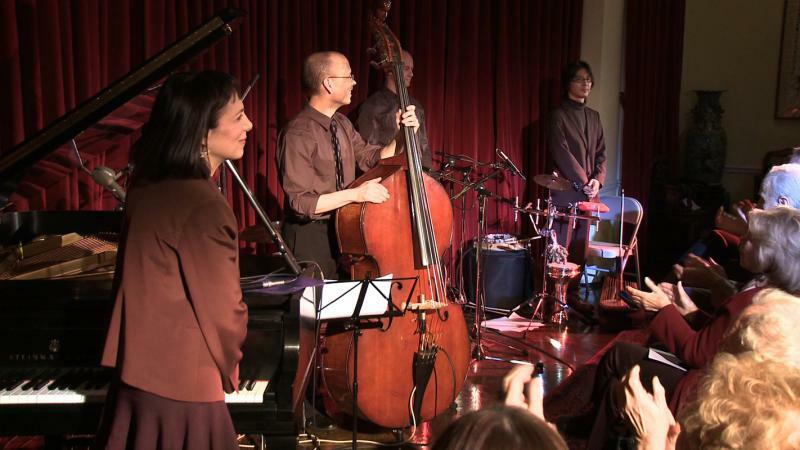 The performance was part of the Shandalee Music Festival's winter series of concerts known as the New York Showcase, and the venue is a family townhouse on the Upper East Side of Manhattan. "That's why the surroundings are so nice. One thing that cracked me up when I saw the footage is that there's a Buddha over my shoulder through the performance," says Pintchik, laughing. "The room is full of wonderful paintings and sculpture; there's some wonderful Asian art. Also, the piano is really excellent." 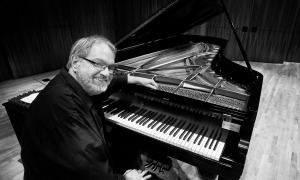 Pintchik's comment about the quality of the piano is a reminder that pianists must always be ready to play a different instrument every time they perform at a new venue. Her description of how she deals with the issue reveals a very organic relationship with the instrument: "I like a warm, round sound, and sometimes I feel like the piano I'm playing is shrieking. That's not the mood I want to convey. So I might change what I plan to playtake a certain part of my repertoire that's more suitable for the instrument. Ideally you try to create a sound in your head and reproduce it through the instrument, and there is something spiritual about that. So in difficult situations, I try to remind myself that it's up to the musicianthe instrument wants to play music, but it can be a challenge. Sometimes I fail that challenge. Once I was playing a piano that decayed really quicklyit had no bloom, like speaking to someone with no affect. The first half of the gig, I was almost whacking it because I was so upset, but then after the break I decided to be more relaxed, to try to get a more vocal quality from the instrument. And it helped, at least in terms of how I was feeling." From her earliest years as a jazz musician, Pintchik was composing as well as playing. Her style, she feels, developed almost subconsciously from the combination of these two creative activities. "I think that it does happen like that. 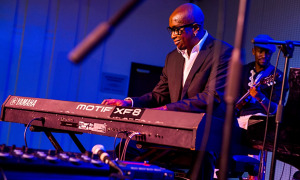 I think the way I play, at least initially, came about from the composing that I was doing. I felt comfortable as a writer before I did so as a player. I don't know why that was, but I think that the way I play grew out of the feeling and the narrative of different pieces. A tune like 'Mortal' [from So Glad To Be Here], for example, has a tremendous amount of silence, and you have to experience that silence. That's a big part of my voice." Her style certainly does make use of space, doing so with great effect. The risk with such a calm and meditative approach is that it could give the erroneous impression that her playing is simplistic. Pintchik is not above a spot of self-deprecation on the matter: "Someone once came up to me at a gig and said, 'How long will I have to practice before I sound like you?' I was taken aback and just said, without meaning to be glib, 'Oh, not long!'" 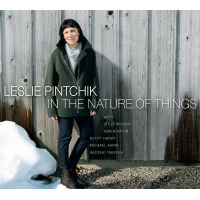 While Pintchik composes tunes herself, she also covers the work of other writers. This is, of course, a very common strategy for a jazz musician, but her own approach is unusual. "I'm drawn to something that touches me," she says, "both in my own writing and in terms of choosing other composers' tunes. It usually starts with a feeling that I have. Then I work to clarify and refine that feeling. I definitely don't go towards a particular composer or even a particular genre." The pianist's lack of concern with genre boundaries is ably illustrated by her selection of tunes across her three albums. The majority are originals, by Pintchik or occasionally by Hardy, and there are a few classic American Songbook numbers too. 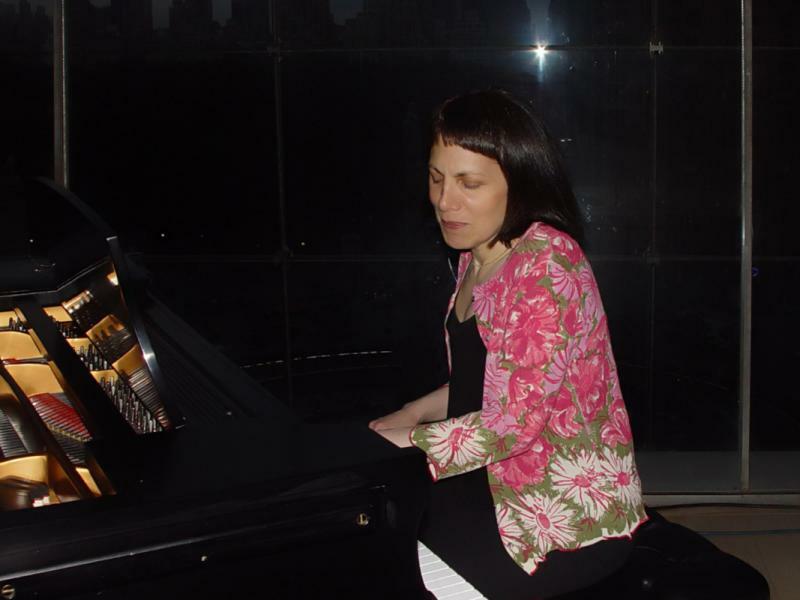 Many contemporary jazz pianists regularly record their own versions of classic jazz piano tunes, but Pintchik has only covered one tune by a recognized jazz pianist: Thelonious Monk's "We See," on So Glad To Be Here. Most intriguingly, We're Here To Listen features two striking covers of what could loosely be termed American roots classicsBob Dylan's iconic "Blowin' in the Wind" and Allen Shamblin and Mike Reid's lovely Americana torch song, "I Can't Make You Love Me." The latter song is probably best known in Bonnie Raitt's version, but it's by no means part of the jazz canon. "I'm a big Bonnie Raitt fan," says Pintchik, "but some jazz people hadn't even heard of the song. Obviously, a lot of people are doing versions of pop tunes, more so than in the past, but there are still plenty of jazz musicians who are not interested in things outside the jazz field. For me, everything is an expression of who you are, so it doesn't matter where the music comes from." While Pintchik has created some beautiful tunes, she has not, to date, written any lyrics. Given her love of literature, is this something she has plans to develop? "I haven't thought of writing lyrics," she replies, "although a lot of people ask me about it. Someone commented that my tunes are 'very lyricalthey should have lyrics put to them,' so perhaps that's something for the future." It may seem rather counterintuitive to think that a love and understanding of literature could be a problem for an artist, but Pintchik did initially believe this: "When I first made the switch from a life teaching literature to a life in music, I was so painfully aware of how rudimentary my music skills were and how much I would need to learnand so latethat I regretted the time spent in literature." Her view has changed with time, and she is now more positive about the place of literature in her own approach to music: "I feel now that all that I've read informs the music I hear and play, and that is probably especially true for the music I compose. I'm only guessing, but perhaps my background in literature and poetry is part of the reason that I initially felt most comfortable as a composer, rather than as a player. In the end, everything in anyone's life, artist or not, is grist for the mill, and I'm grateful to have had the chance to explore two different kinds of art. I sense that it has enriched me in ways I can't articulate, but nonetheless feel." In July 2010 Pintchik was invited to write a short piece for the Jazz Journalists Association website about the role of the music critic. 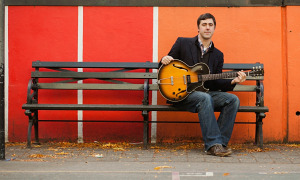 Her life as a Columbia University teaching assistant gives her the kind of insight into criticism that few other jazz musicians possess, and the article is an insightful consideration of this rather difficult- to-define and at times esoteric activity. As well as making some perceptive points about the abilities required of a critic, the article also offers one of the finest comments made about the music of Monk: "Monk's compositions sound to this day like they were written tomorrow." Pintchik laughs loudly when the article is mentioned. In it, she discusses how important it may be for the reviewer to have historical and technical knowledge of the music, but makes the point that what is required above all is an "agile and open mind." It's a point that she makes again: "It really depends on who you areas a writer, a musician, any human. It's who you are that gives your words some weight, some gravity. It's not just a musical issue, it's a human issue. ... In the end, every writer, like every musician, has their own voice and it's very complex and marbled with many issues." What does Pintchik have planned for the future? Unlike many jazz musicians, she is not someone who spends a lot of time on the road. Perhaps the time is right for the band to tour more widely? "That's true. We've had some steady work in New York, and I haven't really traveled. In the future, I'd like to have the chance to do so and play to a wider range of people. I'd like to work more with the trio and the quartet, another CD project, more writing. Beyond that, I don't know." 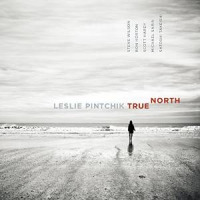 Although Pintchik has her own label, there are no plans to record other artists: "No, not as yet. I have some friends who are great musicians, and part of me would like to work with other people, but it's a big project. It would be a nice thing to do."